2. Add a an aircraft configuration manager to load and save aircraft configurations, edit payload and fuel, manage doors, provide configuration options (feature merge with Config_A32xFD-FMC.ini) and maybe allow controller axis configuration. 3. OPTIONAL: Revise payload stations in Aircraft.cfg. Haven't decided on any 3D work in the cockpit yet. Does anyone use the 2D panel? I'd like to remove it (main panel, ECU, gear, overhead) to free up some windows in the panel.cfg. The magnified displays and the 2D RMP/ACP will definitely stay in. Here there are links to the latest A320 panel beta 2.0b release from Francois and in addition a new configuration option. I use the 2d panels for startup, it much easier and there were things on the panel that weren't on the 3d VC. Also the ignition switch has never worked for me on the VC leaving me having to use the 2d panel. I am not sure if your version fixes this but people could have problems without 2d panels. I also found there was no VC logo light on the old version. Ignore that if you already fixed it. The engine mode selector (ignition) switch works in the latest fork and is required to start the engines. Logo lighting (or the switch) has been in the VC for a while. Making 2D panels adds quite some more work to an already slim time budget. Hence my question. I don't use the 2d panel. Why should I when I have the VC? Need to start the engines? Do that from the VC. Much more realistic. It's a lot easier to start via 2D especially at night when the VC is so dark. However Bjoern has fixed the problems so there's no real need to keep them. Flyer, use the flood lights, you will enlight all the cockpit environment. Real pilots do this also. I do use the lights, its still pretty dark so maybe it's a P3Dv4 thing. In fact they are the only 2D panels I use in the 14 planes I fly regularly. MAJ+9= ND useless for the same reason that PFD. So, 5 shortcuts can be recovered for me. I fixed 2 bugs in the FMC. - When holding pattern was armed but not began, Managed speed was set to 285 kts or max holding pattern speed was applied immediately : bug fixed. Now, max holding pattern speed is applied only when holding begin. and I started to adapt FMC control's commands on the Virtual Cockpit FMC. Great news about the FMC. I'll consider the 2D panels, although I think that the throttle panel can be done away with. Throttles can be controlled with a hardware controller while flaps and spoilers can at least be controlled by keystroke (F5 to F8 or Shift+F5 to Shift-F8). D'accord about the PFD and FD. Good news about the step climb bug, that was the one I reported when the the throttles went to idle? Would it be possible to display the VREF (like the v speeds) somewhere if you cant the the green ball to display on non star flight plans? Also, I find the throttle panel useful as it displays the trim figure, the VC doesn't do that if IIRC. Of course that could be fixed by making the VC trim display the trim figure. Are the S, F and Vapp speeds always displayed on the real bird? Normally, the tooltip of the default trim wheel displays the current pitch trim value. And isn't trim also displayed on the FCTL ECAM page? Yes but even then you don't need them on the real thing as the AT does it for you. Aircraft goes into app mode 30 miles from airport or via pilot actions. at full flaps the AT will go to Vref. I believe this version has the green ball display the VREF which displays if you use the STAR, however it doesn't display if you don't use the star so you have to guess the VREF. Not really good on any jet. And if you fly without any autopilot functions engaged? The AAL Airbus training manual indicates that green dot is always displaying at flaps 0 and indicates the best Lift/Drag ratio. According to the FMS and PFD XML code, green dot speed is always calculated and displayed on the PFD. The only thing I'd change is the flap setting condition to display it. will also change with landing flap configuration. data you put in on taxi out. " Assuming that you don't need an actual flight plan to use the FMGC performance calculations on the real Airbus and considering that we have a simplified FMGC unit, the "APPR" button on the ND control unit can be used to make the (continuously calculated) Vapp triangles display on the PFD. At least that's how I'd do it. I'll leave this to François to decide. You never actually fly the Airbus without the AT unless its an emergency. I know Françoise doesn't want to or can't imitate the AT-Flaps slowdown (I have used it on the Aerosoft Airbus and it's a brilliant system, you never touch the throttles from pulling back from TOGA/Flex until pulling back to idle/reverse when landing) but landing the plane without any VREF or landing speed takes a fair bit of guesswork, especially on the new A330 where the weight different and thus landing speed difference can be very big. That's why I suggested an easy way of doing it by listing the VREF alongside the V Speeds in the FMC if he doesn't want to or can't get the VREF to display on the PFD. I assume the VREF is displayed somehow when you use a star? Great, the stupid board ate my other post and no time to type it all again. Core message and assignment: Get the FCOM of the A320* and find me the page or chapter containing a table with stall speeds (VS or VS1g) for the Buses. From that everything else used by the auto approach speed function in managed speed mode can be worked out. I work hard on VC FMC gauge. I think that I will post tomorrow a small video to show if everybody is ok on the system before go more away. Last edited by fdd_fr on 07 Dec 2017, 13:14, edited 2 times in total. What do you think about a system for dynamically calculating F and S speeds? All we'd need is the stall speeds for the various A32x models and then put them into XMLTables. From there, the integration into the PFD can be a first step before the auto-deceleration feature when in managed speed mode can be implemented. A stall speed table is in FCOM 3.01.20, page 8 or in A319-320-321_Limitations.pdf from SmartCockpit, page 75. Linear interpolation of the lines for an equation would be possible, but I figure that dividing the table into sensible intervals for interpolation by XMLTables would be even better. This could also serve as a basis for the aural stall warning system. And probably for a custom AFLOOR protection. Since my FSX is knocked out cold due to the Windows 10 bug in the current 1709 release, I've continued working on the A32x exterior model animations in 3ds Max. It took me too many hours to redo the downlock mechanism on the main gear. Stupid three-dimensional movement. And things aren't going to be much better from here on (downlock actuators, shock absorbers, brake lines). I believe only the Vref isn't dynamically assigned and that's already done if you use STARS? The flaps limit is something like the VFE -10 knots for each stage and you already have that on the PFD. I would also like to see the ILS button automatically enter approach mode at any point like the real thing too. VREF is 1.23 times VS for flaps down (full) configuration. Only displayed on the MCDU APPR page if landing is planned in FULL configuration. VAPP is VLS + Wind correction. VLS is 1.13 * VS or 1.23 * VS or 1.28 * VS depending on configuration.VAPP is only displayed on the MCDU APPR page. VAPP Target: GS mini + plane headwind = VAPP - Tower Wind (manually entered) + plane headwind. This is what you're seeing on the PFD magenta triangle). All other speeds are explained in the same chapter, 3.04.10 ff and as you will see, all speeds refer to the respective stall speed in some way, which varies with aircraft weight (and pressure altitude). Yes. Possible to do it. Today, onlly minimum speed bar (Orange vertical dot) is calculated according grossweight and flaps configuration. Flyer, about Vref and Vapp, they are already calculated by the FMC (APPROACH window) when you are in approach mode. Vapp is displayed on the PFD's ASI by a small filled cyan triangle. Only Take-Off page and SID page are completed. Take a look about how it work, because I had to find some tricks according FD-FMC logic. And I have some issues with FMC keyboard (double character in some case...). The FMC adaption looks nice. Will there be a clickable 2D FMC window also possible as of today for practical reason? Thanks for the info on the approach speeds, I guess I was looking too early in the flight in the FMC, however it is not displayed on the ASI in an non star flight and I will double check to see if it is displayed in the FMC in approach mode without a star. I think not using a star messes it up. I don't remember if Vref/Vapp works without STAR or approach. I coded this part long time ago....I will check..
Not sure if it works with letters and decimals, but I've got a working method for entering numbers with the keyboard. Might be useful to improve FMC usability. To all who have signed up for "FMC Airport Manager". Thank you for your interest in the software. 5 Days and I think a short tutorial is ready. I ask all who have sent me a PM .... to apology. Unfortunately, the official airport developers seem to have no interest in the help that the program offers. Hundreds of errors are contained in the airports. This can quickly detect and correct by the program. A) shows two waypoint errors. 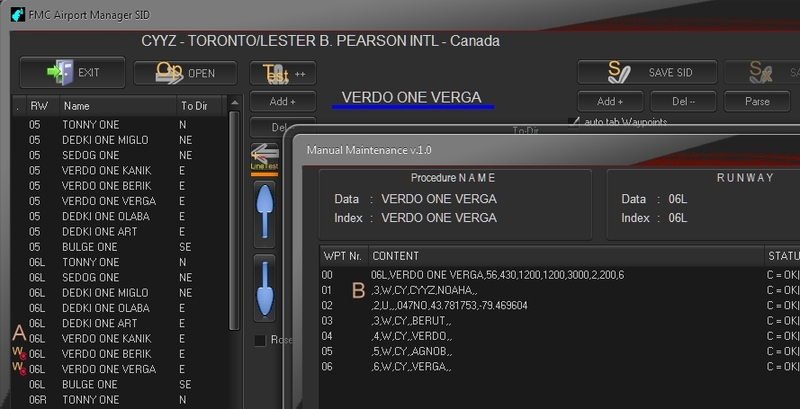 "VERDO ONE BERIK" and "VERDO ONE VERGA"
C) C = OK| S !! 2 : Sort is wrong by "2"
Hi Moskito, is it possible add ATIS frequency to any airport using your program? I have the navigraph AIRAC data, would there be any interest in converting their data automatically so you could have 7000 airports done without much effort? All their data is in plane text. 1.) that's not that easy. For legal reasons you can not just use the AIRAC data. A single user who has purchased an AIRAC cycle may do so on his computer for personal use, but not the FreeNav DB group. 2.) FD-FMC needs more data than in the Navigr. AIRAC data are present. So a manual work at the airports is required. But my next target for "FMC Airport Manager" is to use the AIRAC cycle for the basic data, SID STAR etc. So it is much faster to create an airport. I am to get into negotiations with the AIRAC providers for permission. The ATIS is hardcoded in the AFCAD .bgl file of an scenery add-on. AFAIK : Navigraph cycles has no ATIS information. The Navigraph Charts of course have them. 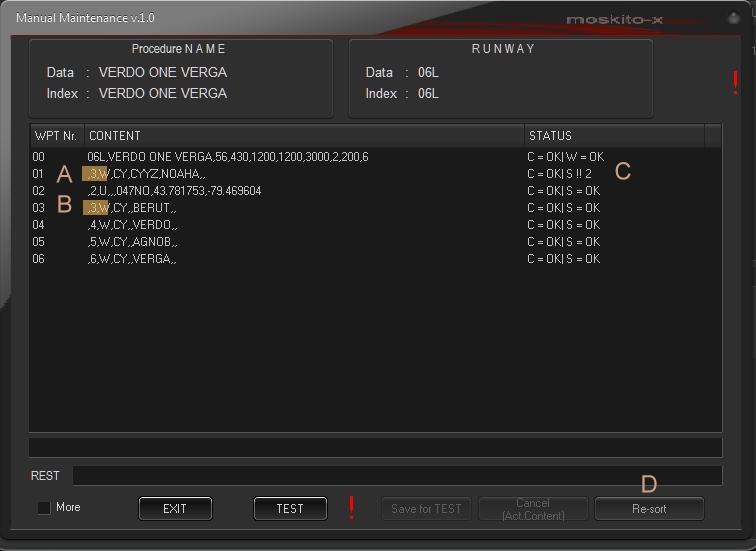 You can use "Airport Design Editor" to change the ATIS frequencies. As far as I know, LittleNavMap (freeware) now comes prepackaged with an AIAC cycle from Navigraph, so chances for success are not the worst. For generating an initial, worldwide starting point, Navigraph's AIRACs are a good idea, but I doubt that you can obtain constant updates for them without investing a considerable amount of money. So future updates might have to be done manually (by using your tool). Interesting tool ! Comes with 1713 AIRAC (at the time 1713 is out). I think 1713 will stay for a long time. Because updating LittleNavMap and as a gift always getting a new AIRAC cycle will not work. If the user always wants to be up to date, from time to time has to buy a new cycle. But a good starting point for a single user. LNM is brilliant better than any payware map/flight planner IMO. I think Navigraph give out a free AIRAC for the program in the hope users will buy the updated data to continue. It's a shame it couldn't be done as it would mean 10 years and 7000 updated SIDs, STARs and approaches all for free. I was going to send a link of one airport to see if the conversion could be done. An excellent idea !!!! I hope that they will give you agreement ! with last airport update, I had a problem with the .KMZ file that is corrupted and all airpots are disappears. So, if someone has on his hard drive the prvious version of this file (November AIRAC) (FD-FMC database.kmz), can you send me please by email (francois.dore at freenavdbgroup.com ), I will restore it. KMZ file for google earth has been fixed and new version is online. I tried to look for the VREF in the FMC in approach mode but I am guessing it is in the approach tab but that is not clickable unless you load a star and approach, so it is impossible to find it for most airports. FMC VC gauge requires many time to be coding..... Today, TO,CLB,CRZ page are ok, SID and STAR selection and some information page. Copy all files ioncluded in the archive in your "Panel" \ A320FD-FMC folder. - in the [VCockpit02] section check path the "A32x_FMC_Dummy.xml" gauge. Previously, that was the common gauge folder. Now, that must be the A320FD-FMC folder. Takeoff, climb, cruise page are fully completed. SID, STAR, departure and arrival pages ok. LEGS not completed. use SHIFT+8 to open 2D gauge. Great work so far, François! - Clicking the "T/O THR" button (2R), "FLEX TEMP" (3R) or "N1" (4R) buttons on "INIT" page 2 returns me to page 1. - "Expedite" thrust can't be selected on the "CLB" page. Is this done from the FCU now? Couldn't test adding a STAR to my flight plan because the APPR page showed my departure airport as the destination. On the DEP/ARR page, the runway list of large airports (e.g. KORD) is not contained to the display area. Thanks Bjoern. I fixed the gauge about to T.O page 1 returns and uploaded it with the same name/link to download. (only A32x_FMC_Dummy.xml changed). The current KORD has 16 runways. Have you thought of abandoning the SIDS and STARs seeing as LittlieNavMap can create flight plans that include SIDs, STARs and transitions from the airac for free? It seems to be a lot of wasted effort now. Then everyone would be able to use every airport at the planes full capability. The problem with LNM's flightplans is that you'll have to set anything up before you start your flight. Every change of the SID or STAR due to runway changes would require you to minimize FSX, change the flight plan in LNM, save it and then load it into FSX. A built-in FMC database allows doing this on the fly (not sorry for the pun). Maybe the flight plan handling can be adapted for flight plans featuring SIDs and STARs that were exported from LNM by comparing them with the A32x' internal database and therefor automatically recognizing that SIDs and STARs are already present. Would be a good reason to investigate general flight plan saving and loading as this is one of the issues I can't get rid of with the FMC, regardless of version. Saving works fine, but every time I try to load the flight after that, FSX throws a "Error loading GPS_Engine". Not sure whether this is a known problem or not. I think I know what causes the GPS_Engine error. Flights exported by Little Navmap and used as the initial flight plan are named, e.g. "IFR Munich (EDDM) to Hamburg (EDDH).pln". Flights exported by the FMC are called, e.g. "IFR Munich to Hamburg.pln"
The [GPS_Engine] section, "Filename=" line in the .flt file, however, points to "IFR Munich (EDDM) to Hamburg (EDDH)", which causes the error (form some reason). If I manually edit the .pln file to point the "Filename=" line to "IFR Munich to Hamburg.pln", the flight and FMC data is loaded without error! This makes things a bit complicated since users need to save their flight plans from Little Navmap with the exact same name that would be used by the default flight planner! Maybe there is a way around this. What ATC are you talking about? Pro ATC automatically updates Sids and stars dependent on any changes, the FP doesnt have any SIds and Stars until you request clearance and then they are assigned,. It should be ok with the default ATC but I don't know about others. That's why I asked if it was possible. I know the plane doesn't reload if a new flight plan is added as long as its either the same name or same ICAOs involved. You would also be using current data instead of 10 year old data. It was just a thought, I was 99% sure everyone would say no! I wasn't talking about ATC, but the A320's FMC and autopilot. ATC doesn't care what SID and STAR you take and whether they were loaded with the initial flight plan or added from the FMS since you're mostly left to your own devices (depending on the ATC client used). I agree that LittlieNavMap seems to be a good tool to create flightplan. But I suppose that it can only create a flight plan so just only waypoints sequence without any data; FSX flightplan format cannot include any data (speed/procedure/constraint) with waypoint. At the origin, I created FD-FMC project for beginners, who want to discover a FMC and a flight management (true vertical navigation). The main part of the project is the aircraft/engine management to climb and descent. So, avoid that user enter manually many data during preflight, this data are include in the airport's files that we create. Freenav files are not only waypoint list, but more (for STAR and approaches) with speed constraints, altitude constraints, procedure (holding pattern, DME ARC, teardrop turn, no-standard approach gradient etc.....). When FD-FMC read Freenav airport files, it get all information to manage the flight and controls the autopilot, engines, and flight controls. All this data cannot be include in a .PLN file. the main part of FD-FMC is not what you see (horizontal navigation) but the aircraft system control (vertical navigation). The only other way is only to use a payware aircraft with a payware AIRAC. I know that my system is not perfect, but it is a simple way to learn how works a FMC, for free. And create airport files is very interesting and gives many pleasure. Now, you can select/enter/delete SID, STAR and approaches. I added a security for the delete function. - Holding button can engage an holding pattern (not tested) when waypoint is active in the flight plan and has an holding pattern. - Arrows buttons scroll SID/STAR/Approachs lists. Yes, you are right, I thought the procedures were saved as user waypoints in the .pln. I know it can be done as pro atc uses a .pln that has sids and stars in it meaning any plane that uses the default navigation becomes an aircraft that that fly airac procedures.